It is important to your mental, emotional and spiritual health to always remember: you OCCUPY this ground until He comes. You do not LIVE here, it is not your home. Your home, everything that speaks and feels like home, the places, the memories, the things, the people, the pets, the views, the structures, the floor-plans, the family and friends, are either in Heaven now or will be in Heaven shortly. Jesus said, "I go to prepare a place your you. If it were not so, I would have told you." (John 14:2-3) Your home is in Heaven. It's all there: the house, the yard, the neighborhood, the friends, the family, the pets, the toys (yes, even the toys) the relationships, the fulfilled longings, the completeness, it's all there. I don't know what it looks like, but I know what it feels like: HOME!!! But until then, we occupy the territory and the ground that we're presently in until He takes us home and we have Matthew 21:21 at our disposal. (I'm gonna make you look that verse up, because anyone too lazy to look it up wouldn't have the faith to believe in it anyway.) There are natural protocols that God has ordained in this world, however, HE is not bound to those natural protocols. (Example: the womb of Sarah VS the wombs of Egypt.) God is in control of the ground in which you occupy. See it in that light, and it will change your perspective on everything. 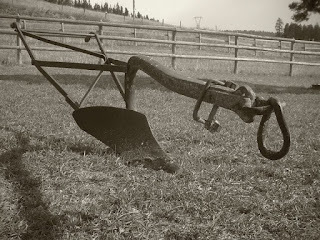 Jesus said, "No one who puts his hand to the plow and looks back is fit for the kingdom of God." (Luke 9:62) Jesus wasn't expressing how to be worthy of Heaven, none of us are worthy. He's talking about the business of the Kingdom, the business of our present occupation until He comes. We're a spiritual occupation force. Our allegiance is to a coming King. Any longing we have for home, the good old days, our youth, the fun we used to have, will all be met in the coming Kingdom. Don't look back, look forward. It's coming! All of it!